2. Our first project: Karam was one of the first organizations to provide emergency aid to Syrians on the ground. Our first project was delivering emergency medical aid to people that were in field hospitals in Homs in 2011. People in the field hospitals were desperate for medical supplies – there was a special kind of gauze that absorbs a large amount of blood for wounds. Board members with family in Homs were able to help us facilitate our distribution of these supplies to people in need. 3. Our first Innovative Education mission: Karam CEO, Lina Sergie Attar visited the IDP camps in 2012. After this trip, she and the board decided to expand Karam's work to provide children with education opportunities. Karam's first Innovative Education mission trip was to Atmeh IDP Camp in 2013 and provided over 500 kids with dental hygiene, literary arts workshops, and sports activities. 4. Our first #GivingTuesday campaign: Our first campaign was the mustache campaign – it was a huge success. It was a great way to engage college-aged students. It was a play on "no-shave November." When we saw how many competitions there were for #GivingTuesday and that we could win cash prizes, people felt motivated to compete because we wanted to win and raise money for our winter aid campaign. It was a very intense time of year! 5. Launched our Scents of Syria line: We began supporting Ghar, a small business run by internally displaced, self-taught Syrian artisan women in November 2014. These women work to support themselves and their family. The embroidery, the laurel soap, and materials they use have a deep sense of attachment to Syria. It becomes very nostalgic for people to have this scent of Syria during the war. We are really proud to be able to share this with people, and also to continue to have enough work to help these women support themselves for their own self worth and dignity. You can shop their products here! 6. Launched our Sponsor a Syrian Refugee Family program: When we were on our mission in Reyhanli in June 2015, we met Iman and by coincidence we learned that her older sister and brother were not in school because they needed to work to support their family. We visited her mother and learned that their father was killed, and it is difficult for women to find work in Reyhanli. We had the idea of supporting their family so that the older kids could return to school. That same summer, the photo of Aylan Kurdi went viral and we were getting many requests from donors to sponsor refugee kids. We created this program with the intention of helping stabilize families in Turkey so that they do not embark on these dangerous journeys and so that their children can go back to school. This is one of our more successful programs, because donors feel a connection to the family they sponsor. 7. Our first #Climb4Karam excursion: We were connected with Mostafa Salameh, a professional mountaineer and motivational speaker. He himself is a refugee, and wanted to organize this climb to help raise funds for our programs. 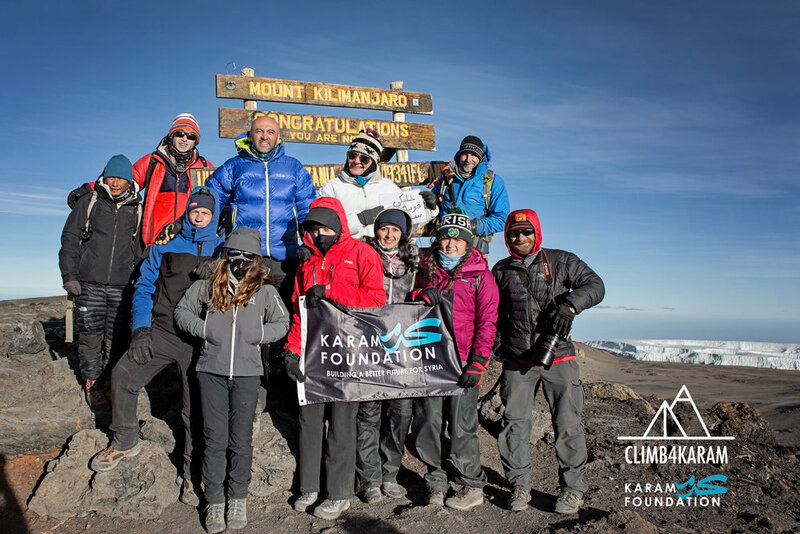 Together, we planned the #Climb4Karam excursion to Kilimanjaro in January 2017. We had 9 climbers who collectively raised over $140K for our programs to support Syrian refugees. 8. Officially opened Karam House: We officially opened Karam House in March 2017. Karam House is unlike any other facility in all of Reyhanli. It is a community innovation center that is designed for Syrian refugee youth. It's a culmination of everything that we learned through our Innovative Education mission trips since 2013. We are offering students year-round, STEAM-based workshops, focusing on advancing students' education and equipping them with the skills they need in order to succeed in their careers or pursuit of higher education. We've made huge strides in our curriculum and we are ready to scale up the idea for Karam House, Istanbul. 9. Support from major influencers: Toward the end of 2016, we caught the attention of actor and emcee, Riz Ahmed who launched the 10FOR10 campaign in support of our emergency aid campaign for the evacuated families of Aleppo. We were also mentioned on Full Frontal with Samantha Bee, who donated proceeds from the "Bad Dudes" t-shirt sales. We also hosted a luncheon with comedian, talkshow host, and author, Chelsea Handler who is sponsoring dozens of families and supported our work for more than a year now. 10. Our first major ad: Thanks to our sponsors, we were gifted the incredible opportunity to have an ad play in Times Square. We are so proud of Suliman, the youngest member of the Karam team. He is a self-taught graphic designer, currently working as our graphic designer in Turkey. He is a Syrian refugee, originally from Damascus.